EVERSHARP carries vintage garden tractor parts, old snowblower parts and antique rototiller parts dating back to the late 1950. We have 1960's & 1950's lawn tractor parts . In addition, we purchased 90% of Corll's Tractor Parts inventory, which included those hard to find, 1950's and 1960's Jacobsen tractor parts, AMF snow blower parts, and MTD garden tractor and chainsaw parts. We also carry parts to vintage briggs & stratton and Kohler engines. 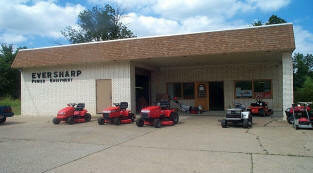 EVERSHARP Power Equipment, Inc. has an extraordinary inventory of old lawnmower parts, antique Lawn & Garden equipment, and vintage power equipment. Many of these parts haven't been manufactured for decades. We supply vintage lawn tractor parts, in addition to old lawn mower parts, we carry chainsaw chains, parts, and saw accessories. EVERSHARP has the vintage small engine parts, antique garden tractor parts, and parts to yesterday's power equipment. We dedicate our 60 years of experience to find vintage repair manuals to your 1950's and 1960's Jacobsen Chief, a classic AMF tractor, or a vintage MTD Rototiller. Whether its a classic garden tractor part for a vintage small engine restoration or a Antique chainsaw part, EVERSHARP Power Equipment, Inc. has what you're trying to find. We represent many companies (see our product lines) and provide our customers access to a fully stocked inventory of replacement small engine parts and power equipment accessories. Can't find a Part anywhere? 2008 Eversharppowerequipment.com, Inc. All Rights Reserved.